The managed print service pilot will deliver a consistent print experience while improving support and reducing costs to campus. This fall, Business Services and IT Services are working with Canon Print Solutions on a production pilot for a managed print service that will deliver a consistent print experience while improving support and reducing costs to campus. The first phase of the pilot involves an assessment to discover what is currently in use within pilot areas and what is recommended to ensure our campus can work effectively and efficiently. 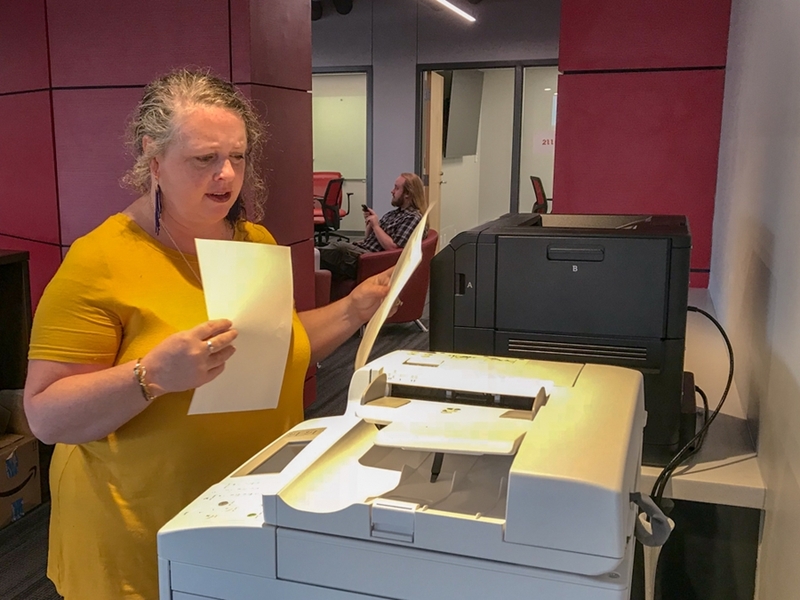 As part of the program, a number of existing printers, copiers and fax machines will be replaced with new, easy-to-use multi-function networked devices. The long-term goal is to narrow the scope from the more than 1,200 unique printer models currently found on campus to our peer institution average of 50. "There will always be a need for printing on our campus. Canon's solution is meant to bring consistency to equipment, service and maintenance throughout our campus," said Teresa Waddell, director of technology for Fulbright College of Arts and Sciences. Adding, "Our goal is not to take your printer but to provide a 21st century print solution that benefits all users while providing cost savings to the university." At this time, the production pilot is underway in select departments within the J. William Fulbright College of Arts and Sciences, University Libraries, and the administrative units of Human Resources, Business Services and IT Services. Managed print service will provide a number of additional benefits outside of cost savings. One benefit, that will ultimately be provided across campus, is follow-me print, which allows users to upload documents to the cloud and release a print copy at a convenient printer anywhere on campus. "We look forward to the day when our students, faculty and staff can send their print jobs via any device, walk up to any managed printer and securely print on the spot. That will be possible when this solution is in place campuswide," said Paige Francis, associate chief information officer. The production pilot is expected to be completed by the end of spring 2019. At that time, results will be analyzed and a plan put in place to implement throughout campus. Contact Paige Francis to learn more.